The Cascade User Conference is an annual gathering of customers, partners, and staff dedicated to sharing what’s awesome, new, and possible with Cascade CMS. This is our 13th year uniting leaders in higher education for two days of informative sessions and networking opportunities. Each year we invite customers from across North America to demonstrate how they use Cascade CMS to solve common problems in their organization. We’re always impressed by their technical ability, innovative ideas, and willingness to share detailed info (and often sample code) with other clients. Here are five reasons that you shouldn’t miss this year’s event. This year’s user conference is at the gorgeous Georgian Terrace Hotel. Not only is the Georgian Terrace one of the most iconic buildings in Atlanta, it’s also one of the nation’s oldest hotels. The Georgian Terrace is conveniently located near tons of restaurants and entertainment venues, including the fabulous Fox Theatre. We’re excited to host #CUC18 here and know you will love the new location. One of the best things about attending #CUC is having access to Cascade CMS experts. Each year our developers offer workshops to help technical users learn how to leverage the power of Cascade CMS to conquer major challenges. 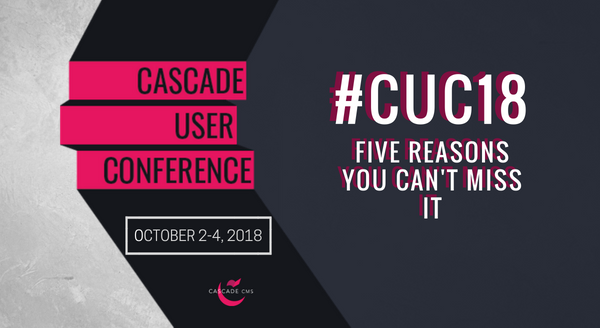 In addition to workshops, #CUC18 attendees can request free consulting sessions for detailed help with specific implementations of Cascade CMS. No matter what industry you’re in, networking a critical part of building a successful career. CUC offers plenty of chances to meet other leaders in higher education. These encounters can lead to long-lasting friendships, employment opportunities, or partnerships that push your business forward. We know how important it is for you to know what’s next with Cascade CMS, that’s why every user conference includes a detailed look at our product roadmap. Our leaders walk attendees through key new features we’re planning to implement and other changes to Cascade CMS. We explain why certain changes are coming and how they will help you and your team be more successful. What’s a user conference without a little fun? Boring, that’s what. We offer two fun-filled social events to finish long days of training and conference sessions. We encourage attendees to mingle, relax, and enjoy a few hours of fun in the heart of Atlanta. At #CUC17, many attendees joined our staff for unofficial social events that made the conference even better.